Nope, not another one of those! Kang Min Ho’s parents past away when he was young, and his uncle takes over the company through some suspicious means. Now that Min Ho is all grown up, he is back as a cold blooded investor seeking vengance under a time crunch. He meets Kim Soon Jung, the daughter of a man he thinks betrayed his father, and his uncle’s current secretary. Through a twist of events, Min Ho receives a heart transplant from Soon Jung’s fiance, Ma Doong Wook. As a result, Min Ho’s entire personality changes and he starts to fall for his former enemy. Thrown in the mix is Lee Joon Hee, a long time admirer of Soon Jung who is not as clean as he appears. I went into this fully expecting another one of those multiple personality dramas that are cropping up everywhere recently, trying to ride off of the fame of It’s Okay, That’s Love, but it completely surprised me in more than one way. First of all, it isn’t about mental illness (at least, not yet) which I can appreciate. A bit off tangent, but I can’t seem to get in line with all the psychological dramas that have become super popular as of late because I find them somewhat distasteful (reasons why I haven’t reviewed any of them). Why? Because I feel like they are capitalizing on the “flash” of the illnesses and are not paying respect to reality. Of course, I didn’t watch any of those shows through so maybe I am entirely wrong (and I would happily be proven so), but from what I’ve seen of them I can’t shake the feeling of them being cheap and shallow. People who actually suffer from these illnesses aren’t tokens of our fantasy, they are real people who need support and help. Anyway, those are my two cents; feel free to disagree with me and I welcome some discussion on this topic below. Now back on track – Falling for Innocence has me falling for it pretty much immediately. All of the characters – yes, even the snobby Min Ho (we all know he will change) – has me cheering for them. I like that it isn’t just a straight forward love story and there is some revenge, scheming and mystery involved. The whole heart donation thing is a little played, but I guess there has to be some sort of dramatic device to move the story along. I haven’t gotten to that part yet, but the whole idea of Dong Wook leaving us is a bit sad because he has been just super adorable! I’m excited to see what the series has in store, and I’ve got quite a bit of catching up to do! So here, off I go! Jung Kyung Ho is the son of famous PD, Jung Eul Young. He broke onto the scene as a supporting character in I’m Sorry, I Love You. He was most recently in thriller film, Manhole. In Jan. 2014 he was confirmed to have been in a relationship with Girl’s Generation’s Choi Soo Young since early 2013. Kim So Yeon set foot in the entertainment industry when she was 14, after entering the Miss Binggrae beauty pagent without her parents’ approval. After a period of low tide in the 2000s, she returned to popularity with big productions such as Iris and Prosecutor Princess. She was most recently in I Need Romance 3. Yoon Hyun Min was one of the only lovable characters in Discovery of Love. He used to be a professional baseball player but has since made the transition into full time acting in a series of supporting roles. He was even nominated for KBS Drama Awards’ Best New Actor for his work in Inspiring Generation and the aforementioned drama. Jin Goo is best known for his character in Mother, for which he collected Best Supporting Actor in both Grand Bell Awards and Blue Dragon Film Awards. In September 21 of last year, he married his long time non-celebrity girlfriend. That was a good read. 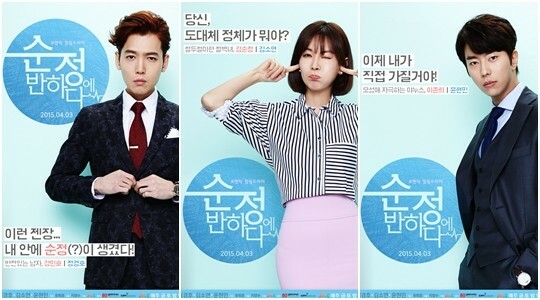 Yep I fell for this drama hard too, and I think the posters don’t even reflect it properly. Because there’s a whole lot of drama in this “rom com”. I was starting to feel for Joon-Hee but he’s much dirtier than I thought. But I can’t get enough of Yoon Hyun-Min’s hotness! Anyway this drama looks promising. I’ve just finished episode 6. Kim So-Yeon, maybe I need to check out Iris, because in PP and INR3 she annoyed me to no end. She’s a good actress, but her roles annoyed me. However she kind of “redeemed” herself as an entertainer with this latest choice. I know! The posters are totally nondescript. The blue is not fluffy enough for a romcom, but the poses are very romcom-ish; quite confusing. I’m glad the series is actually better than the posters! I haven’t seen PP or INR3 actually, but I have wanted to check out Iris for a long time. Mainly because of T.O.P though (I know, I know) hehehee. And YES, about Joon Hee! I like the drama, but I haven’t fallen head over hills for it. There is still time. I personally think that a drama can only be judged by its development, thus far, six episodes in, this is good drama. The acting in on point (98.5% of the time), the writing is bearable (an element which most kdramas lack), progression makes sense, and the pace is just right for a drama that shot with a moderately large and broad concept. Well firstly I disagree with your take on psychological dramas. IMO those dramas actually make people more aware of these mental illnesses and the causes. They can lead to good things too, like Kill Me Heal Me influencing the Korean viewers to support child abuse victims and prevention. Also from my personal experience, while watching these dramas I started reading journal articles from researchers about those mental diseases to understand about them better even though I never had any interest in psychology before. So while of course those dramas are not 100% realistic, but instead of making fun of those who has such disease in real life, they are actually pretty useful in making people realize that there are real patients of those mental disease out there and that they need our help. Now about Falling For Innocence, I also didn’t expect much from this drama since I just went to watch it with zero expectation, but it turns out to be very enjoyable to me! It’s the second drama of the year that makes me want to watch the episodes over and over (the first being Kill Me Heal Me; LOL I’m sorry I’m biased OTL) so that actually speaks a lot in terms of the quality for me. Anyway I can’t wait for the next episodes! Thank you for sharing your thoughts, gammiron! I’m glad you found the dramas insightful and helpful. I agree with you that they do bring a certain amount of awareness, but I worry that a vast majority of the audience are not like you and that they are too focused on the “flash” and are not interested in the reality – or worse, if they misunderstand the reality. But you mentioned that Kill Me, Heal Me had a positive influence on the Korean viewers, so I’m hopeful! I’m not opposed to all psychological dramas – in fact, I welcome them, but from what I have seen and understood, there’s a tendency to mysticize symptoms because they add an extra “coolness” to the character and I’m simply not a fan of that. I loved It’s Okay, That’s Love because I felt it was closer to the truth and brought to surface the struggles and stigma still in existence – never once was anyone’s symptom something to oohh and ahhh at. Maybe I need to give Kill Me, Heal Me another try? Seems like everyone loved it. And I do like Ji Sung a whole lot. I was not going to pick this up simply because the posters made it look so nondescript. Poor girl picked on by mean rich boy with a side romance of smart/quiet guy. Boy, am I glad I didn’t go with that first impression. I have always liked Kim So Yun in the past simply because she is so elegant looking but here she is a totally competent working woman as well. And her character’s boyfriend Dong Wook seems like the boyfriend every woman would want. Yes, yes, there is the whole “mystical heart transplant” aspect but with three episodes under my belt, it’s bearable and I’m enjoying the family/work/friendship as well.